By Regulation (EC) No /2004 (4), the European Parliament and the Council laid down general rules for food business operators on the hygiene of foodstuffs. With regard to public health, these rules contain common principles, in particular in relation to the manufacturers' and competent authorities' responsibilities, structural, operational and hygiene requirements for establishments, procedures for the approval of establishments, requirements for storage and transport and health marks. The requirement in Regulation (EC) No /2004 (5) whereby food business operators carrying out any stage of production, processing and distribution of food after primary production and associated operations must put in place, implement and maintain procedures based on hazard analysis and critical control point (HACCP) principles also permits simplification. The requirements of Regulation (EC) No /2004 (6) are generally sufficient to ensure food safety in establishments carrying out retail activities involving the direct sale or supply of food of animal origin to the final consumer. This Regulation should generally apply to wholesale activities (that is, when a retail establishment carries out operations with a view to supplying food of animal origin to another establishment). Nevertheless, with the exception of the specific temperature requirements laid down in this Regulation, the requirements of Regulation (EC) No /2004 (6) should suffice for wholesale activities consisting only of storage or transport. Member States should have some discretion to extend or to limit the application of the requirements of this Regulation to retail under national law. However, they may limit their application only if they consider that the requirements of Regulation (EC) No /2004 (6) are sufficient to achieve food hygiene objectives and when the supply of food of animal origin from a retail establishment to another establishment is a marginal, localised and restricted activity. Such supply should therefore be only a small part of the establishment's business; the establishments supplied should be situated in its immediate vicinity; and the supply should concern only certain types of products or establishments. The traceability of food is an essential element in ensuring food safety. In addition to complying with the general rules of Regulation (EC) No 178/2002 (7), food business operators responsible for establishments that are subject to approval in accordance with this Regulation should ensure that all products of animal origin that they place on the market bear either a health mark or an identification mark. The adoption of this Regulation should not reduce the level of protection provided by the additional guarantees agreed for Finland and Sweden on their accession to the Community and confirmed by Decisions 94/968/EC (8), 95/50/EC (9), 95/160/EC (10), 95/161/EC (11), 95/168/EC (12), 95/409/EC (13), 95/410/EC (14) and 95/41 I/EC (15). It should establish a procedure for the granting, for a transitional period, of guarantees to any Member State that has an approved national control programme which, for the food of animal origin concerned, is equivalent to those approved for Finland and Sweden. Regulation (EC) No 2160/2003 of the European Parliament and of the Council of 17 November 2003 on the control of salmonella and other specified food-borne zoonotic agents (16) provides for a similar procedure in respect of live animals and hatching eggs. In order to ensure proper inspection of hunted wild game placed on the Community market, bodies of hunted animals and their viscera should be presented for official post-mortem inspection at a game-handling establishment. However, to preserve certain hunting traditions without prejudicing food safety, it is appropriate to provide for training for hunters who place wild game on the market for human consumption. This should enable hunters to undertake an initial examination of wild game on the spot. In these circumstances, it is not necessary to require trained hunters to deliver all viscera to the game-handling establishment for post-mortem examination, if they carry out this initial examination and identity no anomalies or hazards. However, Member States should be allowed to establish stricter rules within their territories to take account of specific risks. The present recasting means that the existing hygiene rules can be repealed. Directive 2004/.../EC of the European Parliament and of the Council ofrepealing certain Directives on food hygiene and health conditions for the production and placing on the market of certain products of animal origin intended for human consumption (17) achieves this. In addition, the rules of this Regulation on eggs replace those of Council Decision 94/371/EC of 20 June 1994 laying down specific public health conditions for the putting on the market of certain types of eggs (18) which the repeal of Annex II to Council Directive 92/118/EEC (19) renders void. 1. This Regulation lays down specific rules on the hygiene of food of animal origin for food business operators. These rules supplement those laid down by Regulation (EC) No /2004 (21). They shall apply to unprocessed and processed products of animal origin. 4. Member States shall establish, under national law, rules governing the activities and persons referred to in paragraph 3(c), (d) and (e). Such national rules shall ensure the achievement of the objectives of this Regulation. 2. Food business operators shall not use any substance other than potable water - or, when Regulation (EC) No /2004 (23) or this Regulation permits its use, clean water - to remove surface contamination from products of animal origin, unless use of the substance has been approved in accordance with the procedure referred to in Article 12(2). Food business operators shall also comply with any conditions for use that may be adopted under the same procedure. The use of an approved substance shall not affect the food business operator's duty to comply with the requirements of this Regulation. retail operations other than those to which this Regulation applies pursuant to Article l(5)(b). 4. Food business operators shall cooperate with the competent authorities in accordance with Regulation (EC) No /2004 (26). In particular, food business operators shall ensure that an establishment ceases to operate if the competent authority withdraws its approval or, in the case of conditional approval, fails to prolong it or to grant full approval. 3. Food business operators may not remove a health mark applied in accordance with Regulation (EC) No /2004 (27) from meat unless they cut or process it or work upon it in another manner. the requirements of Article 14 of Regulation (EC) No [ (30)]/2004 concerning certificates and documents are satisfied, when applicable. 2. By way of derogation from paragraph 1, the importation of fishery products may also take place in accordance with the special provisions laid down in Article 15 of Regulation (EC) No [ (30)]/2004. 4. Food business operators importing food containing both products of plant origin and processed products of animal origin shall ensure that the processed products of animal origin contained in such food satisfy the requirements of paragraphs 1 to 3. They must be able to demonstrate that they have done so (for example, through appropriate documentation or certification, which need not be in the format specified in paragraph l(d)). 4. For the purposes of this Article, "control programme" means a control programme approved in accordance with Regulation (EC) No 2160/2004. permitting the use, with the authorisation of the competent authority, of raw milk not meeting the criteria laid down in Annex III, Section DC, as regards plate count and somatic cell count of the manufacture of cheeses with an ageing or ripening period of at least 60 days, and dairy products obtained in connection with the manufacture of such cheeses, provided that this does not prejudice the achievement of the objectives of this Regulation. 1. The Commission shall, not later than ... (36), submit a report to the European Parliament and the Council reviewing the experience gained from the implementation of this Regulation. (2) OJ C 155,29.5.2001, p. 39. (5) Official Publications Office is to insert official number of Regulation on the hygiene of foodstuffs (as in recital 1). (6) Official Publications Office is to insert official number of Regulation on the hygiene of foodstuffs (as in recital 1). (7) Regulation (EC) No 178/2002 of the European Parliament and of the Council of 28 January 2002 laying down the general principles and requirements of food law, establishing the European Food Safety Authority and laying down procedures in matters of food safety (OJ L 31,1.2.2002, p. 1). Regulation as amended by Regulation (EC) No 1642/2003 (OJ L 245,29.9.2003, p.4). (8) OJ L 371, 31.12.1994, p. 36. (9) OJ L 53, 9.3.1995, p. 31. (10) OJ L 105 9.5.1995, p. 40. (11) OJ L 105, 9.5.1995, p. 44. (12) OJ L 109,16.5.1995, p. 44. (13) OJ L 243,11.10.1995, p. 21. (14) OJ L 243,11.10.1995, p. 25. (15) OJ L 243,11.10.1995, p. 29. (16) OJ L 325, 12.12.2003, p. 1. (17) Page ... of this Official Journal. (18) OJ L 168,2.7.1994, p. 34. (19) Council Directive 92/118/EEC of 17 December 1992 laying down animal health and public health requirements governing trade in and imports into the Community of products not subject to the said requirements laid down in specific Community rules referred to in Annex A (I) to Directive 89/662/EEC and, as regards pathogens, to Directive 90/425/EEC (OJ L 62, 15.3.1993, p. 49). Directive as last amended by Commission Regulation (EC) No 445/2004 (OJ L 72, 11.3.2004, p. 60). (20) OJ L 184, 17.7.1999, p. 23. (21) Official Publications Office is to insert official number of Regulation on the hygiene of foodstuffs. (22) Official Publications Office is to insert official number of Regulation on the hygiene of foodstuffs. (23) Official Publications Office is to insert official number of Regulation on the hygiene of foodstuffs. (24) Page ... of this Official Journal. (25) Official Publications Office is to insert official number of Regulation on the hygiene of foodstuffs. (26) Official Publications Office is to insert official number of Regulation on the organisation of official controls (see Article 4(3)). (27) Official Publications Office is to insert official number of Regulation on the organisation of official controls. (28) Official Publications Office is to insert the official number of the Regulation on the organisation of official controls. (29) Official Publications Office is to insert the official number of the Regulation on the hygiene of foodstuffs. (30) Official Publications Office is to insert the official number of the Regulation on the organisation of official controls. (31) Directive 97/78/EC of 18 December 1997 laying down the principles governing the organisation of veterinary checks on products entering the Community from third countries (OJ L 24,30.1.1998, p. 9). Directive amended by the Act of Accession 2003. (32) Council Directive 2002/99/EC of 16 December 2002 laying down the animal health rules governing the production, processing, distribution and introduction of products of animal origin for human consumption (OJ L 18, 23.1.2003, p. 11). (33) Official Publications Office is to insert the official number of the Regulation on the hygiene of foodstuffs. (34) Official Publications Office is to insert the official number of the Regulation on the hygiene of foodstuffs. (35) Council Directive 96/23/EC of 29 April 1996 on measures to monitor certain substances and residues thereof in live animals and animal products (OJ L 125, 23.5.1996, p. 10). Directive as amended by Regulation (EC) No 806/2003 (OJ L 122, 16.5.2003, p. 1). (36) Five years after the entry into force of this Regulation. (37) Official Publications Office is to insert the official number of the Regulation on the hygiene of foodstuffs. (38) Official Publications Office is to insert here the official number of the Regulation referred to in Article 4(3). (39) Official Publications Office is to insert here the official number of the Directive referred to in recital 25. "Meat" means edible parts of the animals referred to in points 1.2 to 1.8, including blood. "Domestic ungulates" means domestic bovine (including Bubalus and Bison species), porcine, ovine and caprine animals, and domestic solipeds. "Poultry" means farmed birds, including birds that are not considered as domestic but which are farmed as domestic animals, with the exception of ratites. "Lagomorphs" means rabbits, hares and rodents. "Fanned game" means farmed ratites and farmed land mammals other than those referred to in point 1.2. "Small wild game" means wild game birds and lagomorphs living freely in the wild. "Large wild game" means wild land mammals living freely in the wild that do not fall within the definition of small wild game. "Carcase" means the body of an animal after slaughter and dressing. "Fresh meat" means meat that has not undergone any preserving process other than chilling, freezing or quick-freezing, including meat that is vacuum-wrapped or wrapped in a controlled atmosphere. "Offal" means fresh meat other than that of the carcase, including viscera and blood. "Viscera" means the organs of the thoracic, abdominal and pelvic cavities, as well as the trachea and oesophagus and, in birds, the crop. "Minced meat" means boned meat that has been minced into fragments and contains less than 1% salt. "Mechanically separated meat" or "MSM" means the product obtained by removing meat from flesh-bearing bones after boning or from poultry carcases, using mechanical means resulting in the loss or modification of the muscle fibre structure. "Meat preparations" means fresh meat, including meat that has been reduced to fragments, which has had foodstuffs, seasonings or additives added to it or which has undergone processes insufficient to modify the internal muscle fibre structure of the meat and thus to eliminate the characteristics of fresh meat. "Slaughterhouse" means an establishment used for slaughtering and dressing animals, the meat of which is intended for human consumption. "Cutting plant" means an establishment used for boning and/or cutting up meat. "Game-handling establishment" means any establishment in which game and game meat obtained after hunting are prepared for placing on the market. "Bivalve molluscs" means filter-feeding lamellibranch molluscs. "Marine biotoxins" means poisonous substances accumulated by bivalve molluscs, in particular as a result of feeding on plankton containing toxins. "Conditioning" means the storage of live bivalve molluscs coming from class A production areas, purification centres or dispatch centres in tanks or any other installation containing clean seawater, or in natural sites, to remove sand, mud or slime, to preserve or to improve organoleptic qualities and to ensure that they are in a good state of vitality before wrapping or packaging. "Gatherer" means any natural or legal person who collects live bivalve molluscs by any means from a harvesting area for the purpose of handling and placing on the market. "Production area" means any sea, estuarine or lagoon area, containing either natural beds of bivalve molluscs or sites used for the cultivation of bivalve molluscs, and from which live bivalve molluscs are taken. "Relaying area" means any sea, estuarine or lagoon area with boundaries clearly marked and indicated by buoys, posts or any other fixed means, and used exclusively for the natural purification of live bivalve molluscs. "Dispatch centre" means any on-shore or off-shore establishment for the reception, conditioning, washing, cleaning, grading, wrapping and packaging of live bivalve molluscs fit for human consumption. "Purification centre" means an establishment with tanks fed by clean seawater in which live bivalve molluscs are placed for the time necessary to reduce contamination to make them fit for human consumption. "Relaying" means the transfer of live bivalve molluscs to sea, lagoon or estuarine areas for the time necessary to reduce contamination to make them fit for human consumption. This does not include the specific operation of transferring bivalve molluscs to areas more suitable for further growth or fattening. "Fishery products" means all seawater or freshwater animals (except for live bivalve molluscs, live echinoderms, live tunicates and live marine gastropods, and all mammals, reptiles and frogs) whether wild or farmed and including all edible forms, parts and products of such animals. "Factory vessel" means any vessel on board which fishery products undergo one or more of the following operations followed by wrapping or packaging and, if necessary, chilling or freezing: filleting, slicing, skinning, shelling, shucking, mincing or processing. "Freezer vessel" means any vessel on board which freezing of fishery products is carried out, where appropriate after preparatory work such as bleeding, heading, gutting and removal of fins and, where necessary, followed by wrapping or packaging. "Mechanically separated fishery product" means any product obtained by removing flesh from fishery products using mechanical means resulting in the loss or modification of the flesh structure. "Fresh fishery products" means unprocessed fishery products, whether whole or prepared, including products packaged under vacuum or in a modified atmosphere, that have not undergone any treatment to ensure preservation other than chilling. "Prepared fishery products" means unprocessed fishery products that have undergone an operation affecting their anatomical wholeness, such as gutting, heading, slicing, filleting, and chopping. "Raw milk" means milk produced by the secretion of the mammary gland of farmed animals that has not been heated to more than 40oC or undergone any treatment that has an equivalent effect. "Milk production holding" means an establishment where one or more farmed animals are kept to produce milk with a view to placing it on the market as food. "Eggs" means eggs in shell - other than broken, incubated or cooked eggs - that are produced by farmed birds and are fit for direct human consumption or for the preparation of egg products. "Liquid egg" means unprocessed egg contents after removal of the shell. "Cracked eggs" means eggs with damaged shell and intact membranes. "Packing centre" means an establishment where eggs are graded by quality and weight. "Frogs' legs" means the posterior part of the body divided by a transverse cut behind the front limbs, eviscerated and skinned, of the species RNA (family Ranidae). "Snails" means terrestrial gastropods of the species Helix pomatia Linné, Helix aspersa Muller, Helix lucorum and species of the family Achatinidae. "Meat products" means processed products resulting from the processing of meat or from the further processing of such processed products, so that the cut surface shows that the product no longer has the characteristics of fresh meat. "Dairy products" means processed products resulting from the processing of raw milk or from the further processing of such processed products. "Egg products" means processed products resulting from the processing of eggs, or of various components or mixtures of eggs, or from the further processing of such processed products. "Processed fishery products" means processed products resulting from the processing of fishery products or from the further processing of such processed products. "Rendered animal fat" means fat derived from rendering meat, including bones, and intended for human consumption. "Greaves" means the protein-containing residue of rendering, after partial separation of fat and water. "Gelatine" means natural, soluble protein, gelling or non-gelling, obtained by the partial hydrolysis of collagen produced from bones, hides and skins, tendons and sinews of animals. "Collagen" means the protein-based product derived from animal bones, hides, skins and tendons manufactured in accordance with the relevant requirements of this Regulation. "Treated stomachs, bladders and intestines" means stomachs, bladders and intestines that have been submitted to a treatment such as salting, heating or drying after they have been obtained and after cleaning. "Wholesale market" means a food business that includes several separate units which share common installations and sections where foodstuffs are sold to food business operators. An identification mark is not necessary for eggs in respect of which Regulation (EC) No 1907/90 (1) lays down requirements concerning labelling or marking. Food business operators must, in accordance with Article 18 of Regulation (EC) No 178/2002, have in place systems and procedures to identify food business operators from whom they have received, and to whom they have delivered, products of animal origin. In the case of liquid, granulate and powdered products of animal origin carried in bulk, and fishery products carried in bulk, an identification mark is not necessary if accompanying documentation contains the information specified in paragraphs 6, 7 and, where appropriate, 8. Food business operators operating slaughterhouses must ensure that the procedures that they have put in place in accordance with the general requirements of Article 5 of Regulation (EC) No.../2004 (2) meet the requirements that the hazard analysis shows to be necessary and the specific requirements listed in paragraph 2. In the event of failure to comply with any of the requirements listed under paragraph 2, the food business operator must notify the official veterinarian and take appropriate measures. Slaughterhouse operators must not accept animals onto the slaughterhouse premises unless they have requested and been provided with relevant food safety information contained in the records kept at the holding of provenance in accordance with Regulation (EC) No.../2004 (3). Food business operators must check passports accompanying domestic solipeds to ensure that the animal is intended for slaughter for human consumption. If they accept the animal for slaughter, they must give the passport to the official veterinarian." (1) Council Regulation (EEC) No 1907/90 of 26 June 1990 on certain marketing standards for eggs (OJ L 173, 6.7.1990, p. 5). Regulation as last amended by Regulation (EC) No 2052/2003 (OJ L 305, 22.11.2003, p. 1). (2) Official Publications Office is to insert the official number of Regulation on the hygiene of foodstuffs. (3) Official Oublications Office is to insert the official number of Regulation on the hygiene of foodstuffs. They must have facilities for disinfecting tools with hot water supplied at not less than 82oC, or an alternative system having an equivalent effect. have facilities for disinfecting tools with hot water supplied at not less than 82oC, or an alternative system having an equivalent effect. Slaughterhouse operators must follow the instructions of the veterinarian appointed by the competent authority in accordance with Regulation (EC) No.../2004 (1) to ensure that ante-mortem inspection of every animal to be slaughtered is carried out under suitable conditions. Slaughterhouse operators must follow the instructions of the competent authority to ensure that post-mortem inspection of all slaughtered animals is carried out under suitable conditions in accordance with Regulation (EC) No.../2004 (2). The slaughtered animal must be fit for human consumption following post-mortem inspection carried out in the slaughterhouse in accordance with Regulation (EC) No.../2004 (3), including any additional tests required in the case of emergency slaughter. Food business operators may not place meat from animals having undergone emergency slaughter on the market unless it bears a special health mark which cannot be confused either with the health mark provided for in Regulation (EC) No.../2004 (3) or with the identification mark provided for in Annex II, Section I to this Regulation. Such meat may be placed on the market only in the Member State where slaughter takes place and in accordance with national law. Unless other specific provisions provide otherwise, post-mortem inspection must be followed immediately by chilling in the slaughterhouse to ensure a temperature throughout the meat of not more than 3oC for offal and 7oC for other meat along a chilling curve that ensures a continuous decrease of the temperature. However, meat may be cut and boned during chilling in accordance with Chapter V, point 4. After inspection and evisceration, slaughtered animals must be cleaned and chilled to not more than 4oC as soon as possible, unless the meat is cut while warm. The slaughtered animal must be accompanied to the slaughterhouse by a certificate issued by the official veterinarian or approved veterinarian in accordance with Regulation (EC) No .../2004 (4). In the case of poultry reared for the production of "foie gras", the uneviscerated birds must be transported immediately and, if necessary, refrigerated to a slaughterhouse or cutting plant. They must be eviscerated within 24 hours of slaughter under the supervision of the competent authority. Delayed eviscerated poultry obtained at the farm of production may be kept for up to 15 days at a temperature of not more than 4oC. It must then be eviscerated in a slaughterhouse or in a cutting plant located in the same Member State as the farm of production. The provisions of Section I apply to the production and placing on the market of meat from even-toed farmed, game mammals (Crevice and Suede), unless the competent authority considers them inappropriate. Food business operators may also slaughter bison on the farm in accordance with paragraph 3 in exceptional circumstances. It is however enough if at least one person of a hunting team has the knowledge referred to in paragraph 1. References in this Section to a "trained person" are references to that person. The trained person must carry out an examination of the body, and of any viscera removed, to identify any characteristics that may indicate that the meat presents a health risk. The examination must take place as soon as possible after killing. If no trained person is available to carry out the examination referred to in paragraph 2 in a particular case, the head (except for tusks, antlers and horns) and all the viscera except for the stomach and the intestines must accompany the body. Chilling must begin within a reasonable period of time after killing and achieve a temperature throughout the meat of not more than 7oC. Where climatic conditions so permit, active chilling is not necessary. after skinning, it undergoes a final inspection in accordance with Regulation (EC) NO .../2004 (5). Chilling must begin within a reasonable period of time of killing and achieve a temperature throughout the meat of not more than 4oC. Where climatic conditions so permit, active chilling is not necessary. Evisceration must be carried out, or completed, without undue delay upon arrival at the game-handling establishment, unless the competent authority permits otherwise. frozen to an internal temperature of not more than -18oC. Raw material for deboning from an on-site slaughterhouse must be no more than 7 days old; otherwise, raw material for deboning must be no more than 5 days old. However, poultry carcases must be no more than 3 days old. If not used immediately after being obtained, MSM must be wrapped or packaged and then chilled to a temperature of not more than 2oC or frozen to an internal temperature of not more than -18oC. These temperature requirements must be maintained during storage and transport. If the food business operator has carried out analyses demonstrating that MSM complies with the microbiological criteria for minced meat adopted in accordance with Regulation (EC) No.../2004 (6) it may be used in meat preparations that are clearly not intended to be consumed without first undergoing heat treatment and in meat products. If mechanical separation does not take place immediately after deboning the flesh-bearing bones must be stored and transported at a temperature of not more than 2oC or, if frozen, at a temperature of not more than -18oC. If not used within one hour of being obtained, MSM must be chilled immediately to a temperature of not more than 2oC. If, after chilling, MSM is not processed within 24 hours, it must be frozen within 12 hours of production and reach an internal temperature of not more than -18oC within six hours. Frozen MSM must be wrapped or packaged before storage or transport, must not be stored for more man three months and must be maintained at a temperature of not more than -18oC during storage and transport. In addition to the requirements of Directive 2000/13/EC (7), food business operators must ensure compliance with the requirement of point 2 if, and to the extent that, national rules in the Member State in the territory of which the product is placed on the market so require. in poultry, the head - except the comb and the ears, the wattles and caruncles - the oesophagus, the crop, the intestines and the genital organs. Chapters I to VIII apply to animals harvested from production areas that the competent authority has classified in accordance with Regulation (EC) No .../2004 (8). Chapter IX applies to pectinidae harvested outside those areas. Chapters V, VI, VIII and IX, and paragraph 3 of Chapter VII, apply to retail. The requirements of this Section supplement those laid down in Regulation (EC) No .../2004 (9). Food business operators may accept batches of live bivalve molluscs only if the documentary requirements set out in paragraphs 3 to 7 have been complied with. Gatherers may only harvest live bivalve molluscs from production areas with fixed locations and boundaries that the competent authority has classified - where appropriate, in cooperation with food business operators - as being of class A, B or C in accordance with Regulation (EC) No .../2004 (10). Food business operators may use only those areas that the competent authority has approved for relaying live bivalve molluscs. Buoys, poles or other fixed means must clearly identity the boundaries of the sites. There must be a minimum distance between relaying areas, and also between relaying areas and production areas, so as to minimise any risk of the spread of contamination. ensure sufficient separation of sites within a relaying area to prevent mixing of batches; the "all in, all out" system must be used, so that a new batch cannot be brought in before the whole of the previous batch has been removed. The quantity of live bivalve molluscs to be purified must not exceed the capacity of the purification centre. The live bivalve molluscs must be continuously purified for a period sufficient to achieve compliance with allow the health standards of Chapter V and microbiological criteria adopted in accordance with Regulation (EC) No .../2004 (11). In addition to ensuring compliance with microbiological criteria adopted in accordance with Regulation (EC) No .../2004 (12), food business operators must ensure that live bivalve molluscs placed on the market for human consumption meet the standards laid down in this Chapter. By way of derogation from Directive 2000/13/EC, the date of minimum durability may be replaced by the entry "these animals must be alive when sold". In addition, where data from official monitoring programmes enable the competent authority to classify fishing grounds - where appropriate, in cooperation with food business operators - the provisions of Chapter II, Part A, apply by analogy to pectinidae. The requirements of this Section supplement those laid down in Regulation (EC) No .../2004 (13). Vessels designed and equipped to preserve fishery products for more than twenty-four hours must be equipped with holds, tanks or containers for the storage of fishery products at the temperatures laid down in Chapter VII. In vessels equipped for chilling fishery products in cooled clean seawater, tanks must incorporate devices for achieving a uniform temperature throughout the tanks. Such devices must achieve a chilling rate that ensures that the mix of fish and clean seawater reaches not more than 3oC 6 hours after loading and not more than 0oC after 16 hours and allow the monitoring and, where necessary, recording of temperatures. meet the requirements for vessels designed and equipped to preserve fishery products for more than 24 hours laid down in Part B, paragraph 2. However, factory vessels on board which crustaceans and molluscs are cooked, chilled and wrapped, need not meet the requirements of paragraph 1 if no other form of handling or processing takes place on board such vessels. Where freezing in brine of whole fish intended for canning is practised, a temperature of not more than -9oC must be achieved for the product. The brine must not be a source of contamination for the fish. Food business operators must cooperate with relevant competent authorities so as to permit them to carry out official controls in accordance with Regulation (EC) No.../2004 (14), in particular as regards any notification procedures for the landing of fishery products that the competent authority of the Member State the flag of which the vessel is flying or the competent authority of the Member State where the fishery products are landed might consider necessary. Establishments on land that freeze fishery products must have equipment that satisfies the requirements laid down for freezer vessels in Chapter I, Part I.C, points 1 and 2. 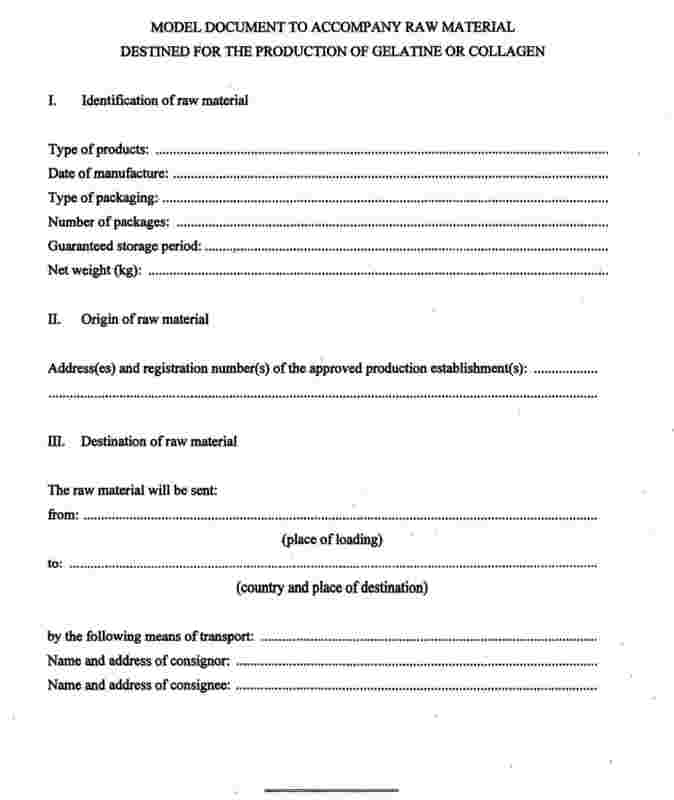 A document from the manufacturer, stating the type of process they have undergone, must accompany fishery products referred to in paragraph 1 when placed on the market, except when supplied to the final consumer. In addition to ensuring compliance with microbiological criteria adopted in accordance with Regulation (EC) No .../2004 (15), food business operators must ensure, depending on the nature of the product or the species, that fishery products placed on the market for human consumption meet the standards laid down in this Chapter. Food business operators must carry out an organoleptic examination of fishery products. In particular, this examination must ensure that fishery products comply with any freshness criteria. Receptacles in which fresh fishery products are kept under ice must be water-resistant and ensure that melt water does not remain in contact with the products. Frozen fishery products must be kept at a temperature of not more than -18oC in all parts of the product; however, whole frozen fish in brine intended for the manufacture of canned food may be kept at a temperature of not more than -9oC. frozen fishery products, with the exception of frozen fish in brine intended for the manufacture of canned food, must be maintained during transport at an even temperature of not more than -18oC in all parts of the product, possibly with short upward fluctuations of not more than 3oC. Food business operators need not comply with point l(b) when frozen fishery products are transported from a cold store to an approved establishment to be thawed on arrival for the purposes of preparation and/or processing, if the journey is short and the competent authority so permits. Raw milk from any animal not complying with the requirements of points 1 to 3 - in particular, any animal showing individually a positive reaction to the prophylactic tests vis-a-vis tuberculosis or brucellosis as laid down in Directive 64/432/EEC and Directive 91/68/EEC - must not be used for human consumption. Immediately after milking, milk must be held in a clean place designed and equipped to avoid contamination. It must be cooled immediately to not more than 8oC in the case of daily collection, or not more than 6oC if collection is not daily. During transport the cold chain must be maintained and, on arrival at the establishment of destination, the temperature of the milk must not be more than 10oC. Persons performing milking must maintain a high degree of personal cleanliness. Suitable facilities must be available near the place of milking to enable persons performing milking and handling raw milk to wash their hands and arms. However, if raw milk from species other than cows is intended for the manufacture of products made with raw milk by a process that does not involve any heat treatment, food business operators must take steps to ensure that the raw milk used meets the following criterion. Rolling geometric average over a two-month period, with at least two samples per month. Rolling geometric average over a three-month period, with at least one sample per month, unless the competent authority specifies another methodology to take account of seasonal variations in production levels. Food business operators must ensure that, upon acceptance at a processing establishment, milk is quickly cooled to not more than 6oC and kept at that temperature until processed. When raw milk or dairy products undergo heat treatment, food business operators must ensure that this satisfies the requirements of Regulation (EC) No .../2004 (19), Annex II, Chapter XI. comply with any requirements that the competent authority may impose in this regard when approving establishments or carrying out checks in accordance with Regulation (EC) No .../2004 (20). processed cows' milk used to prepare dairy products has a plate count at 30oC of less than 100 000 per ml. When milk fails to meet the criteria laid down in paragraph 1, the food business operator must inform the competent authority and take measures to correct the situation. in the case of products made with raw milk, the manufacturing process for which does not include any heat treatment or any physical or chemical treatment, the words "made with raw milk". The requirements of paragraph 1 apply to products destined for retail trade. The term "labelling" includes any packaging, document, notice, label, ring or collar accompanying or referring to such products. operations other man those referred to in points 1 and 2. Liquid egg obtained in an establishment approved for that purpose may be used as raw material. Liquid egg must be obtained in accordance with the requirements of points 1,2,3,4 and 7 of Part III. If processing is not carried out immediately after breaking, liquid egg must be stored either frozen or at a temperature of not more than 4oC. The storage period before processing at 4oC must not exceed 48 hours. However, these requirements do not apply to products to be de-sugared, if de-sugaring process is performed as soon as possible. Products that have not been stabilised so as to be kept at room temperature must be cooled to not more than 4oC. Products for freezing must be frozen immediately after processing. In the case of liquid eggs, the label referred to in paragraph 1 must also bear the words: "non-pasteurised egg products - to be treated at place of destination" and indicate the date and hour of breaking. Centres for the collection of raw materials and further transport to processing establishments must be equipped with facilities for the storage of raw materials at a temperature of not more than 7oC. However, the refrigeration facilities required under points 1 and 2(a) are not necessary if the arrangements for the supply of raw materials ensure that they are never stored or transported without active refrigeration otherwise than as provided for in Chapter II, point l(d). be transported, and stored until rendering, in hygienic conditions and at an internal temperature of not more than 7oC. However, raw materials may be stored and transported without active refrigeration if rendered within 12 hours after the day on which they were obtained. at a temperature of not more than -18oC. When greaves are rendered at a temperature of more than 70oC and have a moisture content of less than 10% (m/m), there are no specific requirements. Treated stomachs, bladders and intestines that cannot be kept at ambient temperature must be stored chilled using facilities intended for that purpose until their dispatch. In particular, products that are not salted or dried must be kept at a temperature of not more than 3oC. For the purpose of this Section, "tanning" means the hardening of hides, using vegetable tanning agents, chromium salts or other substances such as aluminium salts, ferric salts, silicic salts, aldehydes and quinones, or other synthetic hardening agents. Raw materials listed in point l(a) to (e) must derive from animals which have been slaughtered in a slaughterhouse and whose carcases have been found fit for human consumption following ante-mortem and post-mortem inspection or, in the case of hides and skins from wild game, found fit for human consumption. Raw materials must come from establishments registered or approved under Regulation (EC) No .../2004 (24) or under this Regulation. Raw materials listed in point l(a) to (d) must derive from animals which have been slaughtered in a slaughterhouse and whose carcases have been found fit for human consumption following ante-and post-mortem inspection or, in the case of hides and skins from wild game, found fit for human consumption. Raw materials must come from establishments registered or approved under Regulation (EC) No .../2004 (25) or under this Regulation. After having been subjected to the process referred to in paragraph 1 above, collagen may undergo a drying process. Wrapping and packaging containing collagen must bear the words "collagen fit for human consumption" and indicate the date of preparation. (1) Official Publications Office is to insert the official number of Regulation on the organisation of official controls. (2) Official Publications Office is to insert the official number of Regulation on the organisation of official controls. (3) Official Publications Office is to insert the official number of Regulation on the organisation of official controls. (4) Official Publications Office is to insert the official number of Regulation on the organisation of official controls. (5) Official Publications Office is to insert the official number of Regulation on the organisation of official controls. (6) Official Publications Office is to insert the official number of Regulation on the hygiene of foodstuffs. (7) Directive 2000/13/EC of the European Parliament and of the Council of 20 March 2000 on the approximation of the laws of the Member States relating to the labelling, presentation and advertising of foodstuffs (OJ L 109, 6.5.2000, p. 29). Directive as last amended by Directive 2003/89/EC (OJ L 308, 25.11.2001, p. 15). (8) Official Publications Office is to insert the official number of Regulation on the organisation of official controls. (9) Official Publications Office is to insert the official number of Regulation on the hygiene of foodstuffs. (10) Official Publications Office is to insert the official number of Regulation on the organisation of official controls. (11) Official Publications Office is to insert the official number of Regulation on the hygiene of foodstuffs. (12) Official Publications Office is to insert the official number of Regulation on the hygiene of foodstuffs. (13) Official Publications Office is to insert the official number of Regulation on the hygiene of foodstuffs. (14) Official Publications Office is to insert the official number of Regulation on the organisation of official controls. (15) Official Publications Office is to insert the official number of Regulation on the hygiene of foodstuffs. (16) Council Directive 64/432/EEC of 26 June 1964 on animal health problems affecting intra-Community trade in bovine animals and swine (OJ 121, 29.7.1964, p. 1977/64). Directive as last amended by the 2003 Act of Accession. (17) Council Directive 91/68/EEC of 28 January 1991 on animal health conditions governing intra-Community trade in ovine and caprine animals (OJ L 46, 19.2.1991, p. 19). Directive as last amended by Regulation (EC) No 806/2003 (OJ L 122, 16.5.2003, p.1). (18) Council Regulation (EEC) No 2377/90 of 26 June 1990 laying down a Community procedure for the establishment of maximum residue limits of veterinary medicinal products in foodstuffs of animal origin (OJ L 224, 18.8.1990, p. 1). Regulation as last amended by Commission Regulation (EC) No 324/2004 (OJ L 58, 26.2.2004, p. 16). (19) Official Publications Office is to insert official number of Regulation on the hygiene of foodstuffs. (20) Official Publications Office is to insert official number of Regulation on the organisation of official controls. (22) Rendered animal fat obtained by low-temperature rendering of fresh fat from the heart, caul, kidneys and mesentery of bovine animals, and fat from cutting rooms. (23) Rendered animal fat obtained from the adipose tissues of porcine animals. (24) Official Publications Office is to insert official number of Regulation on the hygiene of foodstuffs.